The son and youngest child of Agincourt business people Franz and Edith Wasserman, Karl’s artistic talents exhibited themselves very early and received encouragement from his parents and siblings. After school, young Karl (sometimes “Carl”) produced signs and advertising art for the family business Wasserman Hardware, and after graduation it had always been imagined that he would study art in Europe; the family had been emigrants from Austria and still had connections in Graz and Vienna. But World War I and its aftermath had made that difficult, so he went instead to the school of the Chicago Art Institute. He returned to Agincourt for the 1925 Christmas holidays, just as an opening on the Normal School faculty enabled him to remain. Wasserman chaired the Art Department there for more than thirty years. Outside his role as teacher, Wasserman exhibited at the Memorial Gallery in one-person and group shows and also received commissions for both public and private work. His WPA murals in the City Hall chamber are an allegory for the rising and falling of government. And his “Stations of the Cross” of 1950 still hang in Christ the King Roman Catholic church. The Community Collection has two of his smaller works: “The View from my Window” and “Our Founder”. 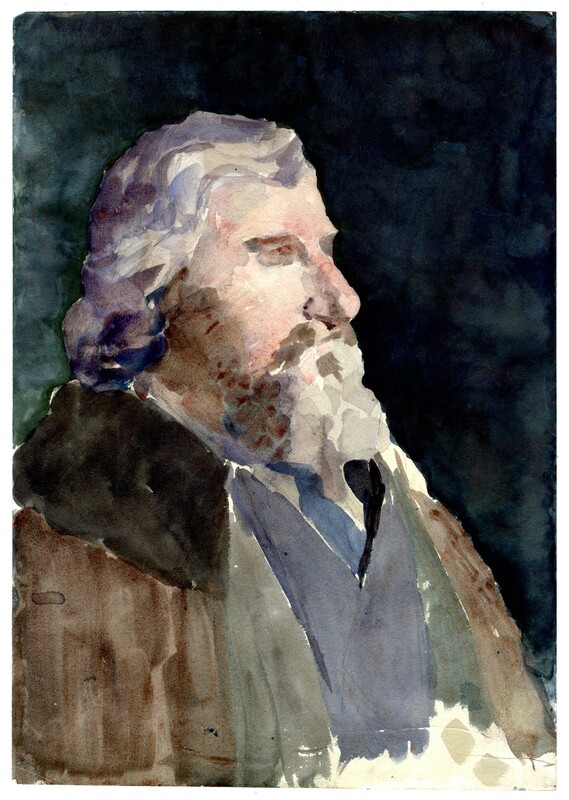 “Our Founder” is a portrait of the English founder of the Arts & Crafts movement William Morris. But, rather than being a commissioned piece, the small watercolor was bartered with Agincourt’s legendary bookseller Hamish Brookes. It appears to have been Brookes who titled the work, a reference to Morris’s role in the revival of letterpess printing and his Kelmscott Press. Wasserman and Brookes may have exchanged the art for a Kelmscott title, and it was Brookes who gave the painting to the Community Collection. By agincourtiowa in Landscapes & Livestock, Uncategorized on Saturday/16/November/2013 .